Mr. Mercedes Review - King Adaptation Is Brilliant But Drags - Are You Screening? Mr. Mercedes is a weird story, and it makes for an even weirder TV adaptation, but working against convention has helped Stephen King get where he is, and TV could probably use a lot more of the idea. The show opens with a mass killing as a man drives a stolen Mercedes through a crowd waiting to get into a job fair. Bill Hodges (Brendan Gleeson) is one of the detectives on the case and getting justice for the 16 people who were killed becomes a mission that consumes him. We jump two years into the future and Hodges has retired, but Mr. Mercedes (Harry Treadaway) isn’t done with him yet. 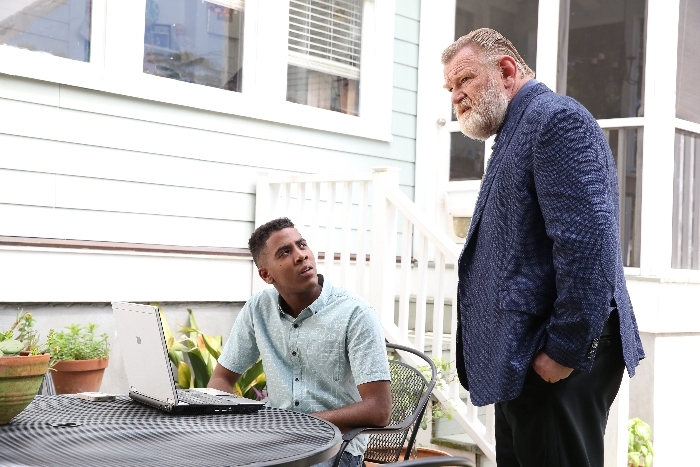 Sending him taunting messages, Mr. Mercedes is after tormenting Hodges as much as possible, and Hodges is now even more desperate to capture him. What’s unique about the show is that we get such an in-depth look at our killer, who we quickly learn is Brady Hartsfield. The show balances the time Hodges is after him with an equal amount of time watching Hartsfield in his humdrum life as a computer technician at a big box store. The show is also fairly unique in that Hartsfield isn’t the sort of lunatic that actually kills a lot of people. He’s very specifically deranged and we dissect him over the course of the series, which provides a far more realistic (seeming… because, who knows?) look at someone who is this far gone. In the two years that Hodges was after Mr. Mercedes officially, he didn’t turn up again, and even as the show progresses we don’t find ourselves with the body count we might expect. What makes the show such engrossing television is unfortunately exactly what might make it hard to get through for some. It’s a plodding development that takes us through Hodges’ entire life, including relationships that don’t ultimately have anything to do with the case. We’re getting characters here in a way that makes for a great book, revealing nuances of depth which hint at motivations, both for the detective and the psychopath, but you have to feel for the viewer who complains that it’s like watching a ten-hour movie… because it is. It’s worth it to watch Brendan Gleeson, who may have been sharper in his career, but has never been more fun to watch. I’m reminded of the film Calvary, because Gleeson is equally in a role that is rather easy to fit into a standard mold, but he makes it one that is rich almost beyond belief. Gruff, curmudgeonly detective is about as straight-forward as it gets, but Gleeson makes Hodges into the relevant, layered character we get in the book. Still, as much as you have to appreciate the idea of mixing up theories of delivery, there’s something difficult to digest about a “thriller” that takes forever. That’s especially true when the case “unfolds” by way of such strange steps, leading to truths the audience already knows, and which perhaps weren’t that interesting anyway. That said, while the very end may leave some viewers wishing for something a little more substantial, the end of the story is a wonderful conclusion to the examination of these characters. There’s something very King-esque about walking around with a crazy person and getting a solid feel for them and their modus operandi only to have the rug pulled out from under you. Sure, this adaptation gives a whole new meaning to the depth available to a character study, but what you weren’t paying attention to all along is that you were studying a psychopath, trying to work out logically how he ticks, which makes no sense. Looking for actual “thrills” in Mr. Mercedes may leave you disappointed, but there aren’t many shows that manage this sort of intensity.